5/ adding comments to posts is not handy, 1st you must read the post (it is not possible to see in the posts list under "content"), use "edit" option (open the post, to read it, then close it), 2nd, click "add comment" and answer the post - why is it so complicated??? 1) which "posts" list do you mean? 3a) for now there is no such option with tokenized link to administrate Phoca Guestbook in frontend. 5) Phoca Guestbook main function was guestbook only. The comments function was added by community members as some additional extra function but it is still mainly guestbook component. Mostly the lists should only include basic not detailed data - to not overload database, to have good overview for the users, etc. but I will try to take a look at it for the next version. Change the 40 to your own value. Where to add the icon for the commands? 1st - main editing place must be the FRONTEND - this is the easiest way how to see whole entry (post) and also there is possibility to answer to that entry/comment (post). It is easier to login in the frontend for eding the content as in the backend (and to find correct comment (post) in the component). 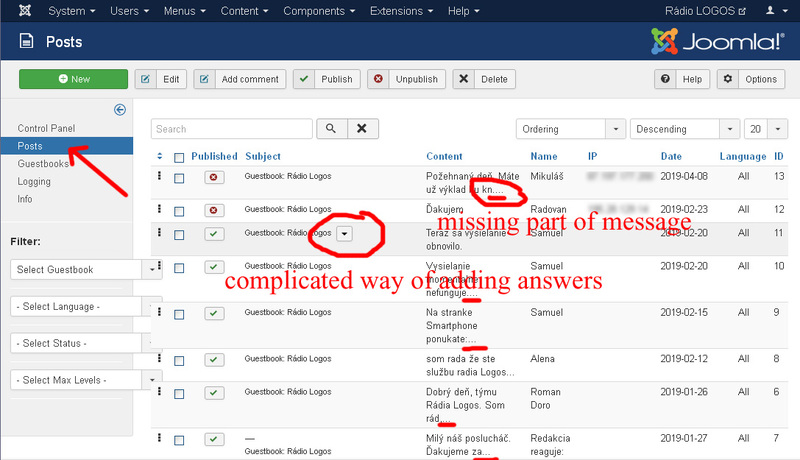 2nd - in the backend, editng the posts (entries) and comments must be in the same window, side by side (in two rows or columns). New or popup window. Hi, thank you for your ideas, I have added them to feature request list, so they can be discussed.